Most people pick either one pair of glasses or one set of contacts, but often find situations where they wish they had an alternative option to their main eyewear. After all, why dress your face in the same outfit every day? 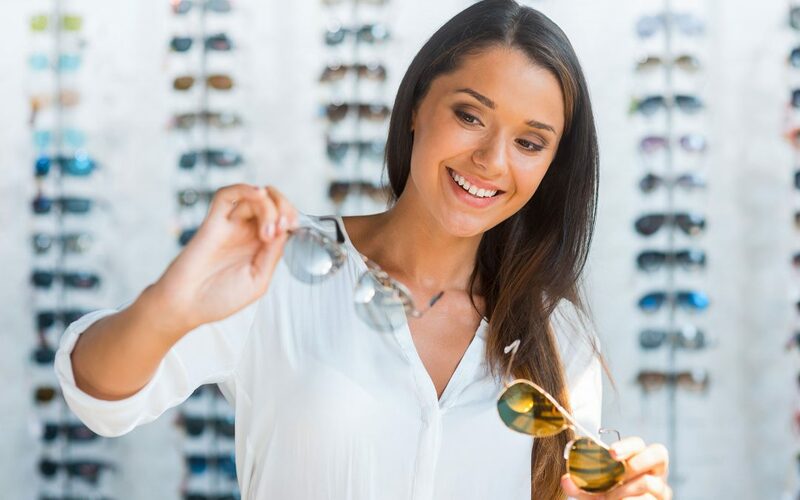 Just like having a few pairs of shoes for different uses, or a special purse for evenings out, having multiple pairs of eyewear can be very fun and superbly functional. There are many reasons why owning multiple pairs of eyeglasses is beneficial. Clumsy or not, you never know what could happen that would cause you to break or lose a pair. Unlike ripping a pair of pants or losing a shoelace, not being unable to see is quite a problem! Although some eye care providers may be able to create glasses in a very short amount of time, you don’t want to be stuck either unable to see, or in an old prescription that will hurt your eyes while you wait for your new eyewear to be created. Maybe you know in advance that you’ll need a different type of eyewear for a specific activity and want to get fit for your specialty eyewear. Eyeglass wearers need at least one pair of regular glasses, but many also have a backup pair of glasses and may opt for a pair of sunglasses, too. Contacts tend to be the go-to for sporting enthusiasts who need varied functionality for their sport, but there are also prescription options for eyewear used in watersports, winter sports, driving, outdoors, and other activities. Other specialty types of glasses that you may need are computer glasses or specialty eyewear for work or hobbies. Those that work long hours on a computer could benefit from investing in a pair of computer glasses. These glasses aid in preventing eyestrain, as they are designed specifically for the distance at which you view a computer monitor. They can cut down on glare and blue light, too. There are many options available for safety prescription glasses for work, and your employer may cover them if you need them for your job. Occupational lenses can be helpful for those who wear bifocals because holding your reading material out far away from your face is not exactly practical nor comfortable. For those whose hobbies include close up work, reading glasses may be helpful for magnification. Of course, the fashion-forward will also enjoy having multiple pairs of glasses to go with different looks. It is tempting to pick up a very colorful pair of funky frames to give yourself a signature look, but you may wonder if the bold look would feel awkward in other settings, like a serious family function or job interview. If you get more than one pair, you can be more creative with one of the frames and a little more conservative with the second pair. Unless you have a certain kind of prescription, the option of contacts is also great. They’re very practical and versatile. Some contact lenses even offer color-changing ability to give your eyes a totally new look. Just like the way different accessories make you feel fancy, professional, or casual, glasses and contacts can do the same. Check your vision benefits to see what coverage is offered for additional eyewear, or ask your eye care professional about price breaks on ordering multiple glasses and contact lenses.